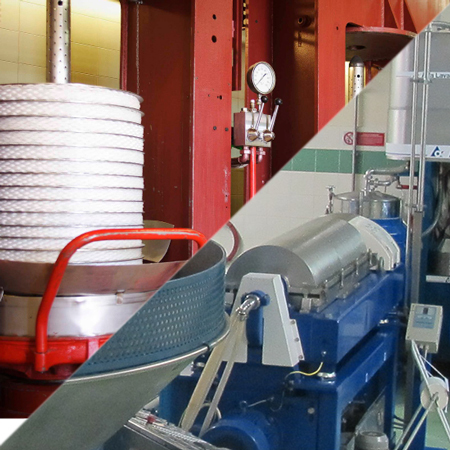 For almost a century now, our company has been following the entire production cycle, integrating traditional techniques with continuous investments in new technologies so as to obtain extremely high quality oil. 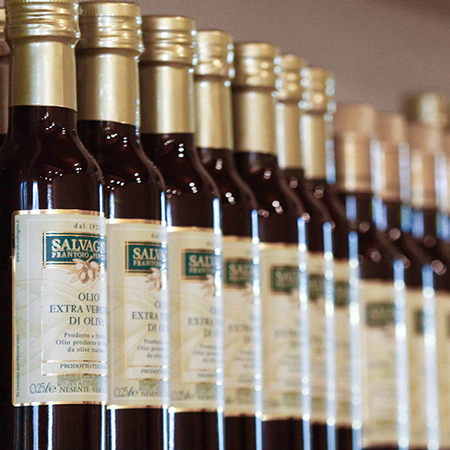 Our extra virgin olive oil is produced in our two oil mills: one is traditional and the other implements a ‘continuous cycle’ system and both use granite mixers to ensure cold pressing. 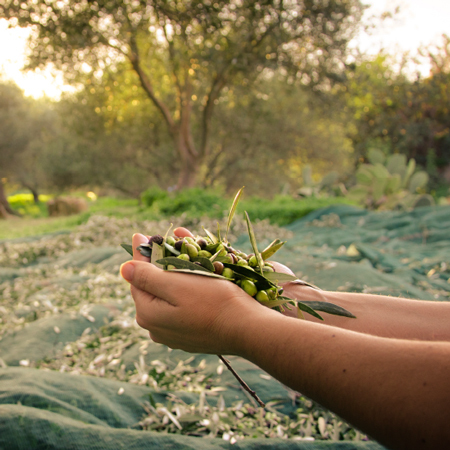 Olive harvesting is still carried out using the traditional "hand picking" system. Nets are laid underneath the olive trees, on which the pickers, using "combs", allow the olives to fall, which are then placed in special plastic crates to ensure proper fruit aeration. 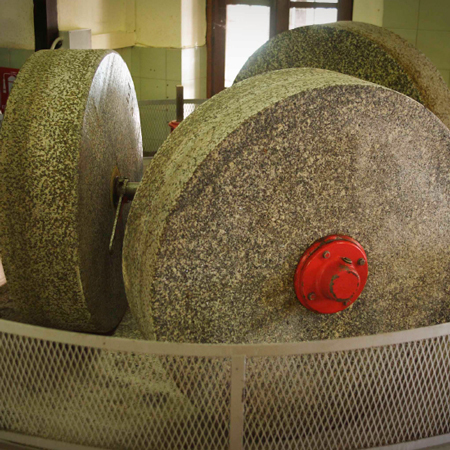 Once the olives are taken to the mill, no later than 24 hours after being picked, they’re defoliated, washed with cold water and slowly ground with traditional granite millstones called "molazze". After roughly 20 minutes processing, the paste is ready to move on to the next step. At this point in the process, despite being ground for some time, the olives have not yet released their precious content. In the traditional oil mill, the olive paste is placed on "fiscoli", interwoven nylon disk mats that are stacked on carts and then placed under the presses to be squeezed very slowly. 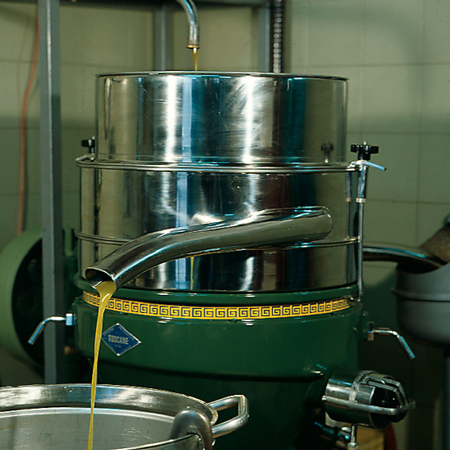 In the ‘continuous cycle’ oil mill, the olive paste is kneaded and then introduced into the decanter, which separates the solid part from the liquid via a centrifugal movement. 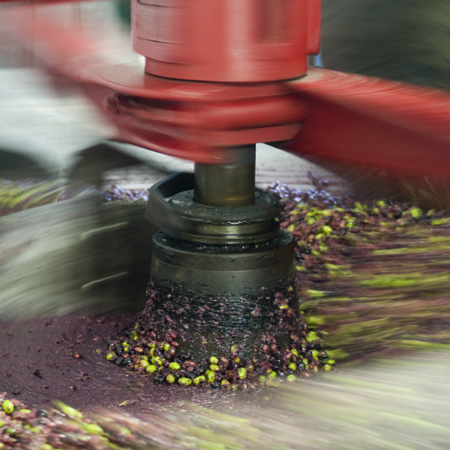 A dark liquid composed of water and oil is produced from the previous processing stages; as with all fruits, olives contain roughly 40/45% water. Oil is on average 15/20%, while the remaining 40% is a residue called "sansa", which stays on the fiscoli mats and is then used as fuel. The final step of the process is the separation of oily must using a centrifugal separator that separates the oil from the water. Once it is taken out of the separator, the oil is slightly filtered using cotton filters in order to remove the last remaining impurities. It is then collected in underground steel tanks, where it is stored at a constant temperature for the entire year. During the year it is then bottled and eventually sold.